The award winning producer Ellen Kent returns in the Spring with three stunning traditional productions. 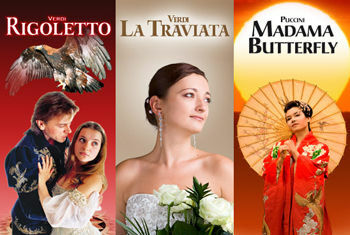 Puccini’s Madama Butterfly, one of the world's most popular operas, Verdi's La Traviata, beautiful, heart-breaking and tragic and Verdi's Rigoletto, the dark opera they tried to ban. RIGOLETTO is a dramatic tale of the jester’s daughter whose heart is stolen by a charming but unreliable ruler – and how her father’s attempts to prevent the love affair lead to tragedy. The opera was almost banned because it exposed the licentious behaviour of the powers-that-be at court. This spectacular magnificently-staged production is inspired by the tradition of renaissance painting, with lavish sets and opulent costumes. It features a magnificent golden eagle with a seven-foot wingspan and two royal greyhounds. Celebrating the return of the critically acclaimed soprano Alyona Kistenyova* as Gilda. Featuring two of the most celebrated tenor arias La Donna è Mobile and Questa o Quella justly turned into classics by Caruso, Rigoletto is based on a play by Victor Hugo, who wrote Les Miserables. LA TRAVIATA is Verdi’s outstanding interpretation of one of the most popular love stories of the 19th Century, La Dame aux Camelias by Alexander Dumas. This is a tragic tale of searing passion and memorable music Dumas made no secret of the fact that his book and play were autobiographically based on his own affair with Marie Duplessis, who died in 1847 of tuberculosis at the age of 23. There are also many echoes of Verdi’s own life in Traviata. The highlights include the Brindisi, the best known drinking song in opera, the duet Un Di Felice and the haunting aria Addio Del Passato. MADAMA BUTTERFLY is Puccini’s popular tale, which the hit West End musical Miss Saigon is based. One of the world’s most popular operas, Puccini’s Madama Butterfly tells the heart-breaking story of the beautiful young Japanese girl who falls in love with an American naval lieutenant – with dramatic results. Highlights include the melodic Humming Chorus, the moving aria One Fine Day and the unforgettable Love Duet. Starring the Korean soprano Maria HeeJung Kim* from the Korean National Opera, Seoul and the international soprano Alyona Kistenyova. * This award winning opera returns with exquisite sets including a spectacular Japanese garden and fabulous costumes including antique wedding kimonos from Japan.